Half a league, half a league, half a league onward into Pasture of Death, City girl and Dog walked onward. Cows to the left of them, Cows to the right, Cows behind them .. mooed and 'thundered'. Dodging the cow pies of death, avoiding the drool from the hell, ... okay so it's 'somewhat' how I remember Tennyson's "Charge of the Light Brigade". As Dog and I attempted yet again to dodge the hooved behemoth's to climb the ridge behind us, I was feeling Tennyson the whole way. Dog & I have a ritual at this park. We stay here every year and several times a week we climb to the top of the ridge behind the park and enjoy the vast views of two mountain ranges. Great views and good exercise for me and Dog. This year we arrive to find that our Rancher RV park owner has allowed a herd of cattle to graze in his fields. Fields we have to walk through to get to the ridge! 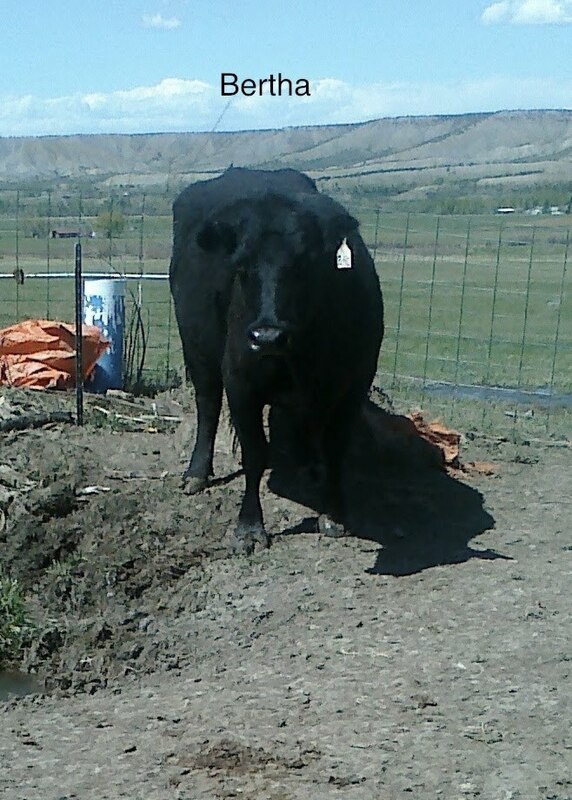 Now City girl that I am, I don't know too much about cattle 'cept they are smelly, drooly, messy and BIG. Frankly, I am a little afraid of them. They know this! I know they know because they have been 'guarding' THE gate I need to get through to get to the ridge ... by standing in the gate opening just daring me and Dog to pass. We did get chased the other day after Dog decided to 'play' (cough .. chase. ) a couple of calves. So today, I am prepared. Shock collar on Dog, I am ready to watch the doggy do back flips instead of being chased. I wannnnt to make it to the ridge. Only one cow is in the pasture today and of course it is guarding the gate. We approach slowly and I tell Dog to stay close. 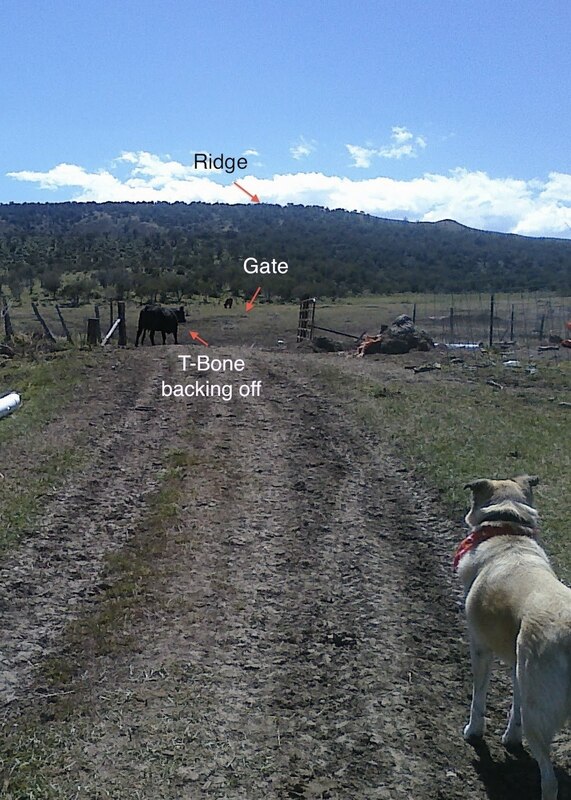 T-Bone backs off and we skirt the fence away from the herd and up the trail. When we reach the safety of the Juniper's, I turn around to see that part of the herd has now moved through the gate and back into the pasture. 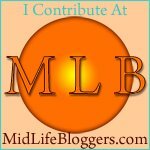 Fear rushes through my mind, "Oh crap, I didn't think about getting back!" Dog and I trudge forward, my mind running a thousand miles an hour when I start to notice it is getting a little hard to breath. Man, I am not used to this altitude, I am not sure I _can_ make it to the top of the ridge! Better sit down under this tree and contemplate my options. Dog is happily pawing at lizards in the scrub brush. A hummingbird keeps zipping around her.. wait that hummer is buzzing her!! I think it thinks her bandana is a flower. Back to the cows, .... man this is a nice view here. The mountains are so pretty, exhale .. take a moment .......... oh yeah .. I am suppose to be 'figuring' here. Focus! The cows that went back into the pasture have moved away from the gate and the ones on the range are still a bit away from the gate so this could be a window of opportunity! I head back down the trail and Dog dutifully follows. As we emerge from the Junipers to the open range a Big Bertha across the way spies us and starts mooing loudly. I watch her and start to angle towards gate. She starts moving and angles toward the gate as well. I pick up my pace and tell Dog to stay with me. Bertha keeps mooing and breaks into a trot. Alas, she beats me to the gate and goes to take a drink just inside the gate. The herd, alerted from her ruckus I'm sure, starts heading towards the gate as well. We take a step through the gate as she drinks and she quickly raises her head and steps toward us. Snot and drool, running down her snoot and off her lip makes my gag reflex kick in. I hear something behind us & turn around to see two baby T-bones in an all out run towards us. I scan our options. I am guessing going over the barbwire would hurt less than being trampled. Dog takes a few steps out towards the oncoming calves and they pull a 'psych' maneuver before they reach us, but there are a few bigs ones coming right behind them. Bertha is still standing her ground. I believe communication is the best problem solver so I decide to try that with Bertha. "Get going, get going, shoo, shoo", I wave my hands at her and the drool continues to drop from her mouth as she chews and stares. I muster my best cow voice, "MOOOooovvveeee!" (Oh yes I did!) Houston, we have contact! Bertha backs up and moves away. Dog and I move quickly through the pasture and through the lower gate. The herd has firmly entrenched their position at the upper gate now and we won't make it the ridge today. We ARE glad to have made it through the Pasture of Death and lived to tell about it!